With summer upon us your drycleaning machine’s cooling system will be under greater stress. It doesn’t matter if you’re using a water tower, chiller, or city water for cooling, conditions that weren’t an issue during the cooler months may become problems as the ambient (surrounding) temperature rises. Most cooling problems rear their ugly heads during the drying segment of the drycleaning cycle. Drying, in the drycleaning machine sense, is all about moving heat energy. The media which moves all this heat is called a refrigerant (most machines use R22 Freon. Some of the newer models and K4 machines use R400 Freon as refrigerants) and some form of coolant (generally water or a water and glycol mixture). It doesn’t matter which Freon used, the process itself requires a device called a REFRIGERATION CONDENSER which changes hot, vapor rich, Freon gas back into liquid Freon which is constantly being recycled during the drying segment of the drycleaning cycle. In almost every case this condenser is cooled by a liquid (there are a few air-cooled condensers which are not the topic of this article). Hot, compressed Freon gas if forced by the REFRIGERATION COMPRESSOR into the REFRIGERATION CONDENSER where it is cooled and condensed by water (called a COOLANT) In this case we are transferring the heat from a vapor rich, hot, compressed Freon gas to the coolant flowing through the refrigeration condenser. 1.CITY WATER –water from the city main is forced through the drycleaning machine’s refrigeration condenser propelled by existing city water pressure. The exiting water is then sent down the drain. 2.WATER TOWER – water is circulated by a pump through the drycleaning machine’s refrigeration condenser; over an evaporative cooling media (looks like corrugated plastic tubes) which has air forced though aiding in evaporation; into a sump where the suction inlet of the pump is connected. The evaporation of the water from the surface of the media cools the remaining water which drops into the sump for recirculation through the drycleaning machine’s refrigeration condenser. 3.CHILLER – water or a mixture of water and glycol (this mixture is called a brine) is circulated by a pump through the drycleaning machine’s refrigeration condenser; cooled by a separate refrigeration system; re-circulated through the drycleaning machine’s refrigeration condenser. A.COOLANT FLOW – amount of coolant moving through the condenser. HEAT TRANSFER EFFICIENCY –the ability of the condenser to move heat to the coolant. Each of the above factors can be easily monitored using pressure and temperature as indicators of what is going on in the coolant system. A pressure gage and thermometer at the inlet and outlet of the coolant system located near the drycleaning machine are vital for monitoring cooling system performance. The pump must supply enough pressure and flow in sufficient quantities to push coolant through the components that require cooling on the drycleaning machine (on most machines this would include not only the refrigeration condenser but also the still condenser and solvent cooler); in the case of water towers and chillers also back to the tower or chiller sump which are often located on the roof. Unfortunately, there is no hard, fast rule for nominal pressure readings. The best method for obtaining the “numbers” is to note the drycleaning machine inlet and outlet pressure and temperature readings when the drycleaning machine is working properly for future reference. Let’s have a look at what the thermometers and pressure gages can tell us about the condition of the coolant system. Heavy scale build up – a build-up of scale inside the piping of the drycleaning machine. Low coolant level in the pumping system. Back to the drycleaning machine’s operation: Problems with the cooling system are most likely to appear during the dry cycle, more specifically, toward the end of the dry cycle when the drycleaning machine goes into cool down mode. During the drying mode the heat exchanger coil is transferring much of the heat from the Freon to the air stream and only a small portion of the heat load is being dumped into the refrigeration condenser. In the cool down mode solenoids and dampers change and almost the entire heat load is now dumped into the refrigeration condenser. This type of problem is indicated by the REFRIGERATION COMPRESSOR going into a high-pressure condition and tripping the REFRIGERATION HIGH PRESSURE SAFETY SWITCH. Most of the time this would cause an error message on the programmer screen and require a manual rest of the refrigeration high pressure safety switch. This condition is almost always caused by either a clogged Y strainer or excessive scaling inside the refrigeration condenser. On most drycleaning machines there is a REFRIGERATION HEAD PRESSURE ADJUSTING VALVE which controls the refrigeration head pressure by varying flow of coolant to the refrigeration condenser. This valve is adjusted to give sufficient refrigeration head pressure for efficient refrigeration system operation. When scale builds up in the refrigeration condenser past the point where the normal adjustment of the head pressure adjusting valve can compensate many drycleaners simplly open the valve wider in the VERY MISTAKENbelief they have actually fixed something. What they have done is “kicked the can down the road” and will pay a lot of extra money in solvent and energy for the privilege. 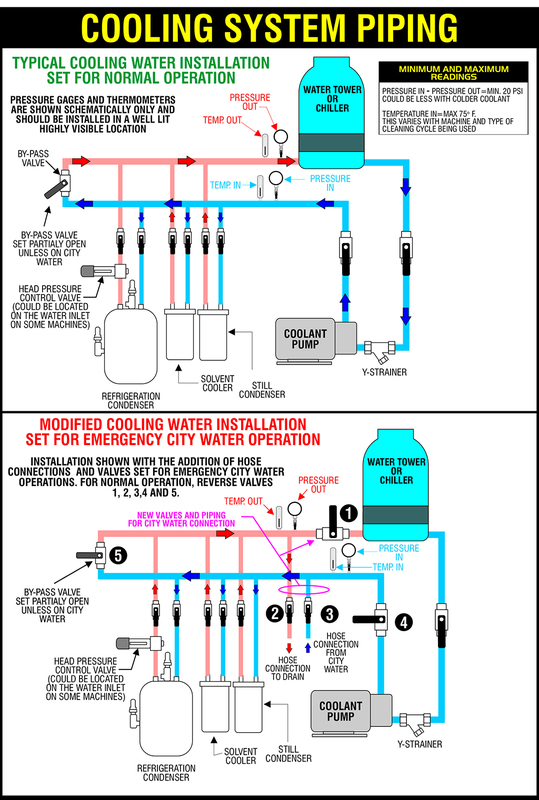 The accompanying illustrations show schematics for typical cooling water installations on systems using a water tower or chiller. The top illustration is what is most commonly found, the bottom is an installation WITH THE ADDITION OF VALVES 1, 2, 3which are used when city water hook-up is included in the installation. This city water hook-up provides not only an emergency back-up for continuing operations when there is a failure in the normal cooling system as well as ready access for connecting a descaling pump. Previous postHow Will Tax Overhaul Impact You and Your Business? I was very pleased to find this internet-site.I needed to thanks to your time for this wonderful learn!! I undoubtedly enjoying each little bit of it and I’ve you bookmarked to take a look at new stuff you blog post.